a way as to amplify the power of the cosmic energies. It has the flower of life made out of genuine Amethyst crystals cut in a specific formation to allow the violet flame to permeate through the tool. 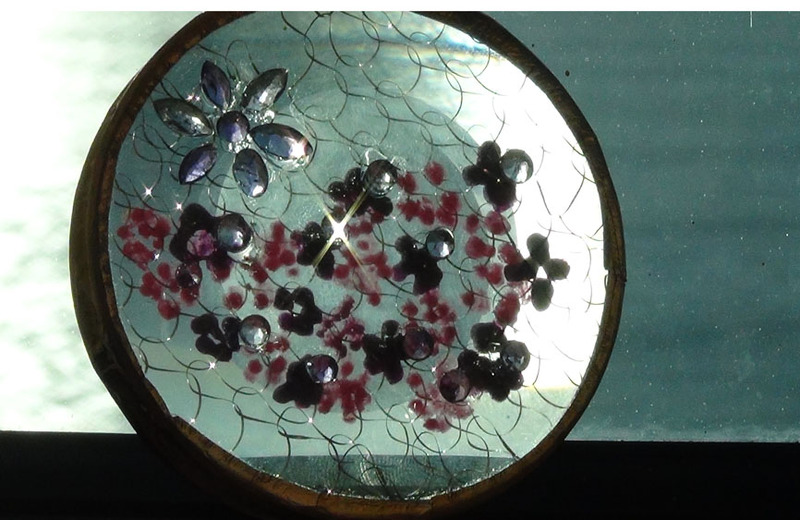 It is hand painted and includes copper “hive” encapsulated within it which activates the crystals and conducts the violet flame energy that much stronger through the tool and onto you. But that will all be explained with the instructional on how to use it and significance behind it and how it all ties together. My St. Germaine disc is amazing. When I was introduced to this "amulet" I really didn't know what to expect. However after just trying it out under a copper pyramid I was floored by the healing results it had. this tool and the other metatron tool I purchased are by far some of the most valuable tools I have to help me ascend. it give me sweet sensation and feel love. I use this product as a gift to my daughter who has been suffering of allergies and cough since we moved to Sedona, she has been using it and the symptoms have diminished greatly. Thank you for helping humanity!!! The saint germain disc was bought for my mom and she really likes it. She meditates with it daily and keeps it under her pillow at night. The disc itself is beautifully crafted. The colours within the quartz are vivid and is a jewel to have. My mom's work eith the disc just began and she has a lot of good intent for the future. Thank you natalya!